The prestigious program is open to any consumer and b2b publishing company, advertising agency or industry partner. min’s Marketing Awards program is dedicated to honoring the campaigns, ongoing programs and innovative people who’ve raised the bar on magazine marketing. The entry deadline is Friday, July 8. The annual awards program is open to any consumer and b2b publishing company and/or person or individual magazine title. Additionally, advertising agencies and corporations are welcome to enter on behalf of or with their magazine partner. Third-party partners serving the industry may also enter. For more information on the min Marketing Awards, visit http://www.minmarketingawards.com. Winners and honorable mentions will be recognized at a celebratory awards breakfast on September 15, 2016 in New York City and on minonline.com. 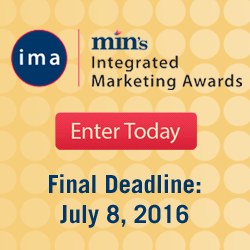 Entries for the 2016 program can be submitted at http://www.minmarketingawards.com. International entries are welcomed. For questions regarding the min Marketing Awards, contact Mary-Lou French at mfrench(at)accessintel(dot)com or (301) 354-1851. To sponsor the awards breakfast in September, contact Tania Babiuk at tbabiuk(at)accessintel(dot)com. The Marketing Awards program is presented by min, the industry's trusted source on the consumer and b2b magazine business, reaching thousands of media executives through print, online and in-person events. For more than 60 years, min has been serving the magazine and media community with unparalleled coverage of this ever-changing industry. For more information, visit http://www.minonline.com.